Bumped: 24, Have You Been Paying Attention? 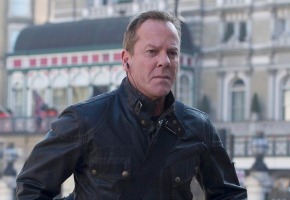 TEN has made a Monday night switcheroo with 24 and Have You Been Paying Attention? Next Monday the shows will swap places, with local quiz show Have You Been Paying Attention? now at 8:40pm and 24 at 9:40pm. This follows disappointing retention between MasterChef Australia and 24, where the network shed some 740,000 viewers. Have You Been Paying Attention? is now in its fourth timeslot. Although host Tom Gleisner has said a late night slot seems like “a natural fit” (and potentially from MA to M) it puts the two local shows back to back. TEN hasn’t revealed what will replace 24 when it wraps after July 21st. I guess we’ll see if this works. As a suggestion though before HYBPA (Have you Been Paying Attention? ) begins do a voice over announcing the change and that 24 will be on afterwards. That way people that don’t know about it are properly informed of what has happened. Plus I assume they’ll mention it on the radio too. I’m a fan of HYBPA (and 24 actually), good to see it found its way to the old GNW timeslot where it belonged right from the outset. It’s fairly harmless, easy to watch TV. Not sure why there’s so much hate in HYBPA’s direction honestly. Whilst I’m a big fan of 24 this probably does make a bit more sense. I used to wonder why hybpa and q&a were on the same time. Both talking about the weeks events I thought there could be somewhat similar audiences to a degree. So lets see what happens next Monday. Viewers wanting 24 tune in at 8:40pm, don’t see it, switch channels. Viewers wanting HYBPA do likewise an hour later, and do the same. Ratings are lower than ever. as Jack would say…. Dammit! I didn’t even know that Dexter was back on Eleven. That channel is just not on my radar any more. It will have to be the last gasp chance for HYBPA. Sandwiched in between Masterchef and the Commonwealth Games is the strongest line up Ten can have for this to be given any chance. But up against The Block after The Voice finishes and X Factor will mean it comes a long distance third in the ratings whether it be 8.30 or 9.30. May as well play the remainder of the Hawaii Five O series once Comm Games finishes in the 9.30 slot. This should have been done straight after the 24 launch. Programming adjacencies are often letting down Ten’s schedule. 6-7pm is obvious, but others such as this are much easier to fix. The family audience watching MasterChef is much more likely to stick around for HYBPA than it is for 24. Also avoids HYBPA going head to head with Q&A. Maybe somebody is reading comments here and on other media sites and finally listening to the feedback. Don’t the Comm Games start on 24th? I’m guessing that will fill the slot for a couple of weeks? It was only a matter of a time before a switch of some sort occurred. Their Monday night won’t improve by much with this change though, I’m certain of that. Have You Been Paying Attention? will surely run out of chances to succeed eventually. I admire Ten’s commitment in a way, but then again, they don’t have much else on the shelf to replace it with. The schedule change for 24 means that it clashes with Dexter on 11 and both shows has Yvonne Strahovski in them. So it is Yvonne Strahovski versus herself. With nearly as many viewers as its name, it’s sad that it’s taken TEN @ 8 weeks to make this programming decision about 24.